As the weather has taken a turn for the worse and temperatures have dropped, I feel like hibernating like this little hedgehog. 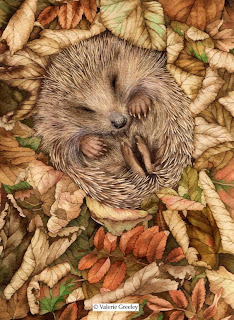 Favourite sites for hibernation are under piles of old leaves and wood stacks so it is very important to look out for these creatures if you are considering lighting a bonfire for November the fifth. The little fellow that modeled for this illustration would be too small to make it through the winter, he was actually curled up in the palm of a hand during a summer visit to an animal sanctuary, (now you know all my secrets). They do need to have reached a good weight before they have built up enough reserves to see them through the winter. I have found a very good website with lots of helpful advice about hedgehog protection, it is owned by The British Hedgehog Preservation Society.The site has easy to follow instructions for creating housing for hedgehogs which would provide shelter during the winter months. Now I own a dog I have become very aware of the effect of fireworks on animals, in fact Ted is reduced to a quivering wreck when he hears a bang. I loved bonfire night when I was a child but I do wish that we could limit our use of fireworks to maybe one week in November. It seems to be the fashion nowadays to have them all year round which makes it difficult for animal owners. 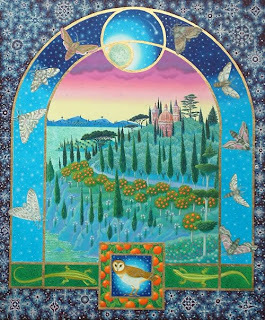 In these days of uncertainty and gloom, isn’t it nice to know that there are artists in the world who are creating work of such beauty and expertise that could rival any of the past masters who created the illuminated manuscripts of bygone years? 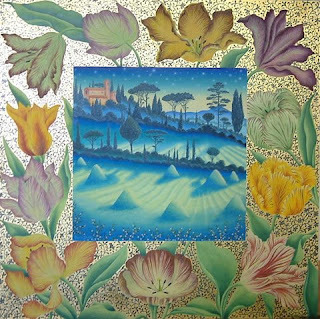 One such artist is Fiona Owen who paints the most exquisite works of art using oil paint on panel and then gilding her work with 24 carat gold in the tradition of the mediaeval manuscripts. 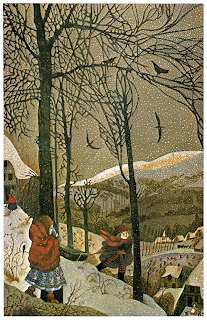 I first became aware of this artist when I received the most beautiful Christmas card, published by The Medici Society, many years ago. It was one of those cards “too lovely to throw away”; I still have it, together with other cards produced over subsequent years and also a baby record book, which Fiona illustrated. 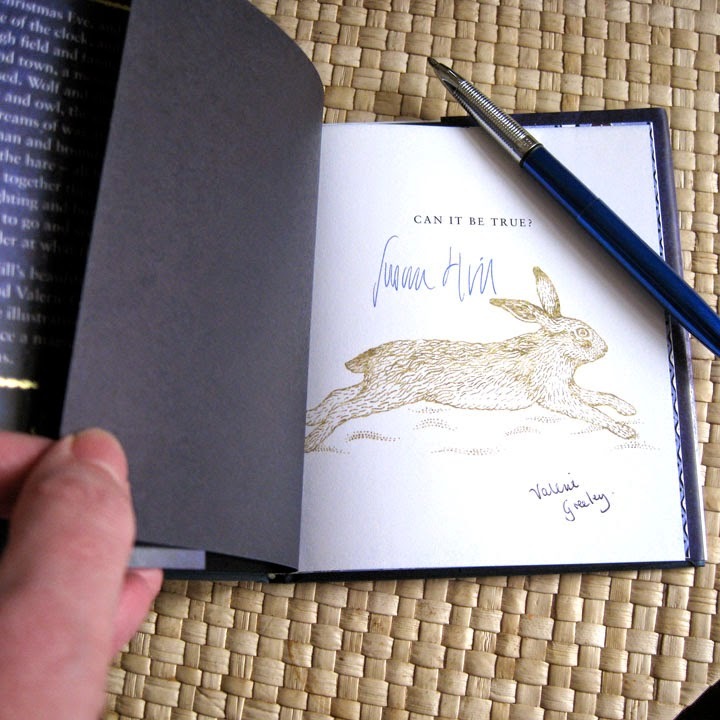 It was my good fortune, in the late eighties, to be invited to provide illustrations for “Little Grey Rabbit’s Country Book”, I learnt later that the publisher wanted Fiona to do the work but she was unable to undertake the task due to family commitments. In those days The Medici Society had an art gallery next door to Collins the publisher and the art director I worked with had first come across Fiona’s work through the gallery. I was very flattered to be given the commission and felt that I had a great deal to live up to knowing the quality of work required. 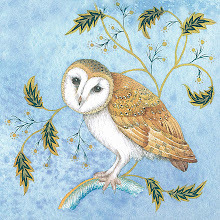 I have never forgotten Fiona’s work and was delighted to find that she has a website which shows many examples of the new work she is now producing. She has very kindly allowed me to show her artwork here, I know that you will enjoy visiting her site and learning more about her work and her most amazing home and garden. It has always seemed inappropriate until now to post a very Christmassy image, however, being mindful of the time needed to plan and sew a Christmas project, here is my Christmas Teddies Collection for Makower UK. 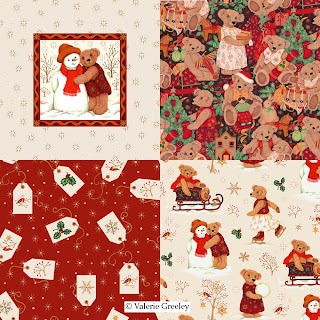 The fabrics have been available since January, it seems that it is never too early to start sewing those Christmas projects. I have to confess that the very idea of Christmas preparations induces mild panic, I am always so slow when it comes to putting up decorations and wrapping presents! Please click on the image to see more clearly. I had great fun in designing this collection and enjoyed mixing up no less than eighteen pots of gouache including gold. This does not show up too well on screen but when you see the actual fabric it does add a very rich luster and I think adds an extra "Christmassy" glitz. 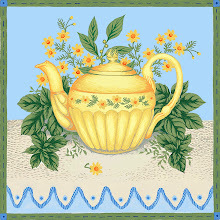 Now you may wonder why I am not showing you examples of my home sewn creations using these fabrics? Well, I do have plans but alas time is whizzing by at an alarming rate. I am reminded of the character from "Dad's Army", the one who yells "Don't panic Mr Mannering, don't panic". I love the idea of wrapping gifts in simple drawstring bags, partly because they look so pretty and partly because unlike expensive wrapping paper, a little bag is more likely to be re-used. Maybe I will find time to sew a couple for under my tree this year. You can see more of these fabrics if you follow the Planet Patchwork link in my side bar. 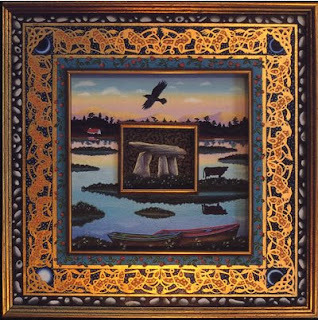 I have been an admirer of the work of Errol Le Cain for many years now and have been delighted to find this website by Michael Sporin, who has posted many images from Le Cain's books and has very kindly agreed to let me share them with you. 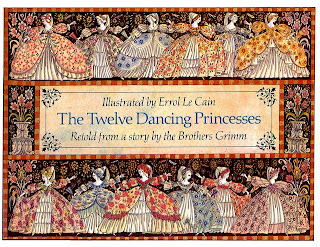 I particularly like the very decorative style of illustration used in the above illustrations taken from "The Thorn Rose", "The Twelve Dancing Princesses" and "the Snow Queen". He was undoubtedly a master of his craft, and a superb artist who's work may well be forgotten as many of his books are now out of print. Fortunately his work is being kept alive by book lovers and collectors and there is now a website dedicated to his work, run by Tania Covo. His work shows the influence of some of the places he has lived, much of his formative years being spent in India and the Far East. 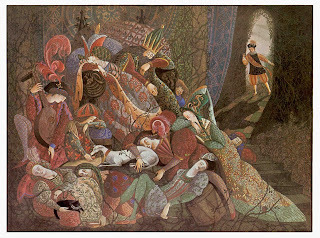 You can read more about his life and work as an illustrator and set designer in the websites mentioned. Sadly, his life was cut short after a long illness, he died whilst still in his forties and no doubt in his creative prime, in 1989. 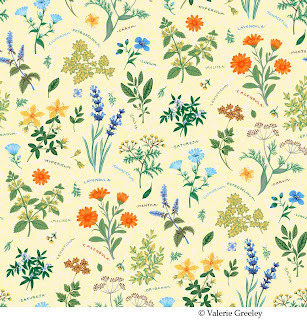 At the moment I am busy working on a new collection of fabric designs for Makower UK. Unfortunately I can't show you these designs at the moment because of copyright protection. 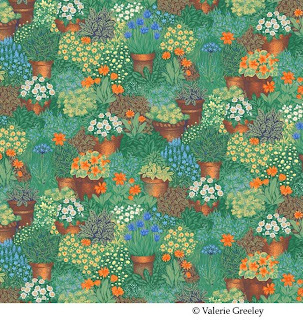 I can however show you my "Herb Garden" Collection which will make it's debut at the quilt market in Houston this month. It seems ages since I delivered the final artwork to the Makower headquarters in Henley-on-Thames, most people are surprised that a fabric design actually starts life as a painted piece of paper. Today I saw it for the first time in print, always an anxious moment. Unlike an illustration for a print reproduction on paper, these fabric designs have to be translated into separate screens, one screen per colour. When you consider that some of the designs contain eighteen different colours, you can imagine the skill of the printer who has to perfectly register each and every colour. Here are two of my favourite designs from the collection, I hope you like them! 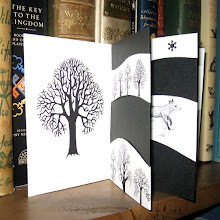 I used some of the images from this collection to make my one of my little artist's books. 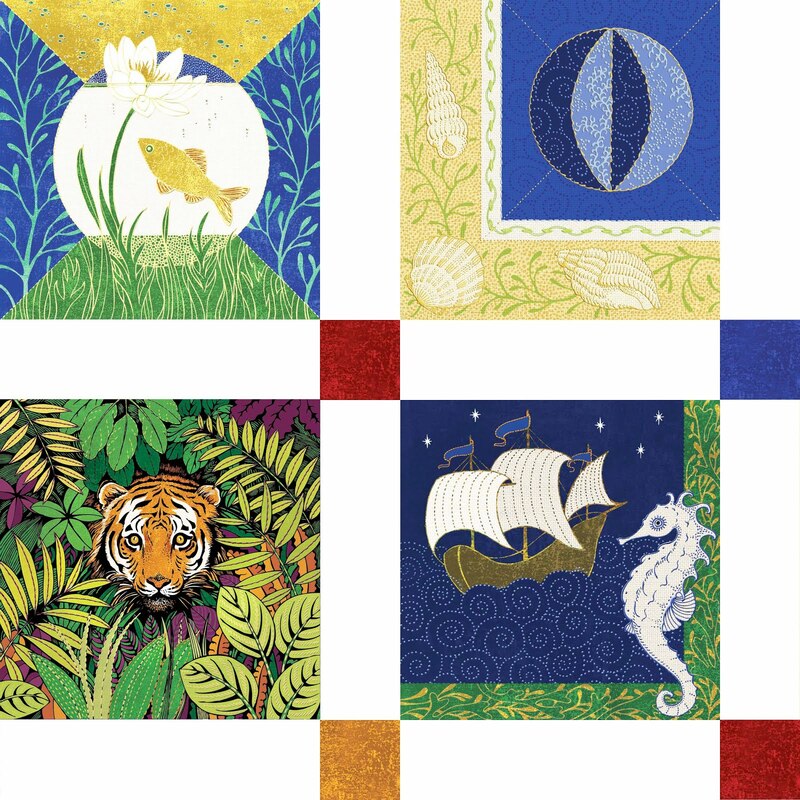 These designs form a decorative panel called a nine square or label design. A term which will be familiar to those of you who quilt. 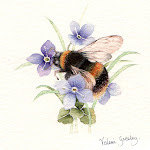 You can see more of these images in my "Herb Garden" miniature book in my Etsy shop. This illustration is my offering for the month of October, it is part of a series of work entitled "Illuminations of Nature". 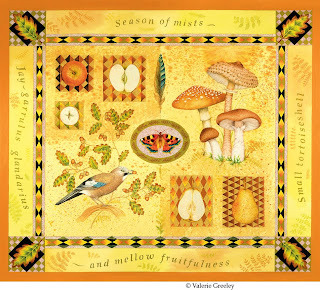 This piece was inspired by the poem "To Autumn" by John Keats. (You can click on the image to see more detail). I chose to include a jay because I love their colours, in particular, the tiny blue, stripy wing feathers. When I was working on "The Acorn's Story" I found out that jays play an important part in the life cycle of an oak tree. The jay will store away acorns rather like a squirrel, in crevices and sometimes it will bury them beneath the earth, these sometimes germinate if conditions are favourable, providing of course that it doesn't decide to eat them first!